Turkey's Reaction to Thanksgiving: They do What? And stuff into WHERE? OH HELL NO! I'm outta HERE!!!! Thanksgiving Day, is a public holiday celebrated on the fourth Thursday of November in the United States. It originated as a harvest festival. Thanksgiving has been celebrated nationally on and off since 1789, after Congress requested a proclamation by George Washington. It has been celebrated as a federal holiday every year since 1863, when, during the American Civil War, President Abraham Lincoln proclaimed a national day of "Thanksgiving and Praise to our beneficent Father who dwelleth in the Heavens," to be celebrated on the last Thursday in November. 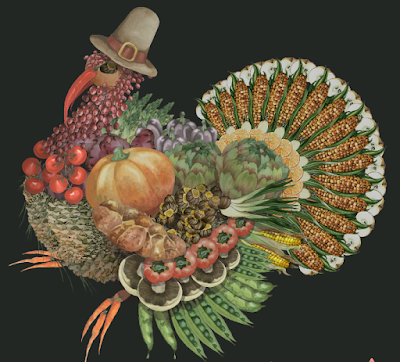 Together with Christmas and the New Year, Thanksgiving is a part of the broader fall/winter holiday season in the U.S.
Americans also trace the Thanksgiving holiday to a 1621 celebration at the Plymouth Plantation, where the settlers held a harvest feast after a successful growing season. Autumn or early winter feasts continued sporadically in later years, first as an impromptu religious observance and later as a civil tradition. Squanto, a Patuxet Native American who resided with the Wampanoag tribe, taught the Pilgrims how to catch eel and grow corn and served as an interpreter for them. Squanto had learned the English language during his enslavement in England. The Wampanoag leader Massasoit had given food to the colonists during the first winter when supplies brought from England were insufficient. The Pilgrims celebrated at Plymouth for three days after their first harvest in 1621. The exact time is unknown, but James Baker, the Plimoth Plantation vice president of research, stated in 1996, "The event occurred between Sept. 21 and Nov. 11, 1621, with the most likely time being around Michaelmas (Sept. 29), the traditional time." Seventeenth-century accounts do not identify this as a Thanksgiving observance, rather it followed the harvest. It included 50 persons who were on the Mayflower (all who remained of the 100 who had landed) and 90 Native Americans. The feast was cooked by the four adult Pilgrim women who survived their first winter in the New World (Eleanor Billington, Elizabeth Hopkins, Mary Brewster, and Susanna White), along with young daughters and male and female servants.